Oran Kearney hailed his strike force after they shot down rivals Ballymena United and sealed Coleraine’s first Irish Cup semi final appearance since 2010. Eoin Bradley and Jamie McGonigle helped themselves to a brace apiece as the Bannsiders blew away David Jeffrey’s men. They may be at different stages in their Irish League careers, but the Sky Blues had no answer to their prowess in front of goal. McGonigle shot the visitors in front with only 12 minutes gone before Bradley fired in his double either side of the break. McGonigle, who turned 21 on Sunday, wrapped up the scoring with 20 minutes to go to complete a memorable day for Kearney’s men. 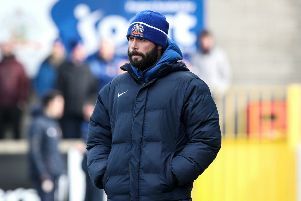 “We are full of young players, but the one thing young players don’t have is experience because it takes years to get that,” said the Bannsiders boss. “Eoin is a big game player with loads of guile. He’s proven in his GAA career he has always been the man for the big occasion. “And he proved it yet again today with the way he led the line. “Having had the taste of winning a medal with Glenavon last season he has said on numerous occasions that he wants it again. “Experienced players are worth their weight in gold, but experienced players who are hungry can have a huge impact on teams. “Eoin makes an enormous difference. But we have also had to cope without him for a number of games, which we won. “He has such a great presence about the place, and he is great with the young players, just having him around the place over the last couple of months has been brilliant. “My biggest grievance would have been going in at only 1-0 at half time. Kearney was equally as pleased with McGonigle, who continues to show a maturity beyond his years. “It’s all about learning for young players,” he said. “Jamie took a bit of stick from some quarters when he didn’t take the chances which came his way on Boxing Day. “But he was quickly reminded that every day is a new game, for what he didn’t do on Boxing Day he showed his ruthless finishing today. “His second finish in particular was a typical Jamie finish, it’s that type of instinctive finish that you can’t coach. The was a lot of hype leading up to the game, but Coleraine managed the occasion well and deservedly secured their place in the last four. “I tried all week to try and take the derby aspect out of the game,” said Kearney. “The Irish Cup has been something of a bug bear for us over the last few seasons. “So for as much as people saw this as a derby match and everything else, for me it was about getting into the semi final of the Irish Cup, which I had yet to do in my tenure here at Coleraine. “It did cross my mind that it would maybe be like after the Lord Mayor’s Show for them. I nearly wished that this game had been straight after their cup final. “It’s human nature as it is hard to continually get yourself up for big games. “Credit to Ballymena they have had a huge amount of big games this season. “I’m glad for our lads though, we have a lot of really good players in that changing room who deserve a crack at this.